In an opinion handed down December 14, the Arkansas Supreme Court adopted the final round of rule changes that clarify the obligations under the Rules of Professional Conduct and Rules of Civil Procedure of attorneys who provide unbundled legal services. 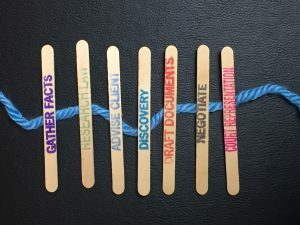 Also known as “limited scope representation” or “a la carte legal services,” unbundling allows for a client to hire an attorney to help with some, but not all, of that client’s legal matter. Such representation can include legal advice, document preparation, document review, or limited appearances on behalf of the client. The opinion includes changes to Rules 11 and 64 of the Arkansas Rules of Civil Procedure, and adds a new Rule 87. 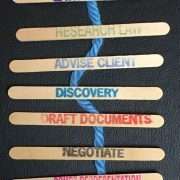 These changes explicitly authorize ghostwriting, lay out a process by which an attorney attorney offering unbundled services can put a court on notice of the extent of representation, and provides for termination of representation without leave of the court upon the filing of a notice of completion of the matter. The rules, as adopted, substantially track the original proposal of the Arkansas Supreme Court Committee on Civil Practice. The only substantive change made is that attorneys who ghostwrite pleadings must disclose their identity in a notation at the end of the document, rather than simply indicating that it was prepared with the assistance of an Arkansas-licensed attorney pursuant to Arkansas Rule of Professional Conduct 1.2(c). Interested in learning more about these rule changes? Join us for a webinar entitled “How to Ethically Unbundle Your Practice” on January 24, 2018 at noon. We’ll cover these rule changes, the Rules of Professional Conduct that authorize unbundling, and more! Sign up here. The Arkansas Access to Justice Commission has released a comprehensive set of recommendations for addressing the legal needs of the growing number of Arkansans who are unable to afford to pay for representation in civil cases that deal with such basic needs as family stability, health care, and economic security. Funded by a 2012 technical assistance grant from the State Justice Institute, the study was completed earlier this year by Greacen Associates, LLC. The study builds on previous research conducted in 2011 by then-Clinton School of Public Service student Chanley Painter. Painter’s study sampled cases in Cleburne, St. Francis, and Pulaski Counties involving domestic relations, guardianships, small estates, foreclosures, and consumer law. Of those cases, 22% to 27% of petitioners represented themselves. Between 90% and 95% of respondents either represented themselves or defaulted. Painter also surveyed circuit court judges regarding their experiences with self-represented litigants. Eighty-four percent of responding judges reported that they have seen an increase in the number of self-represented litigants over the last three years. The study also indicated that lack of legal representation negatively affects court operations and typically results in worse outcomes for SRLs. Ninety-one percent of responding judges reported differences in how efficiently cases are handled when parties are represented by counsel. The SJI grant funded an assessment of the needs of self-represented litigants in Arkansas and a strategic plan for the delivery of services designed to meet the need. Greacen Associates and Commission staff gathered information for the study through a series of interviews with court staff and judges, local attorneys, self-represented litigants, and other stakeholders in five different counties in Arkansas. 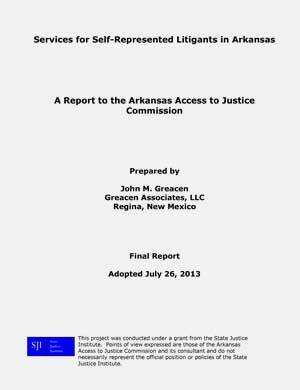 The final report, which was unanimously adopted by the Commission in July, included recommendations for encouraging private lawyers to provide limited scope legal representation; for making legal information and forms more broadly available for civil legal issues that are most prevalent among Arkansans of limited means; and for linking attorneys who provide limited scope services to clients who need them.